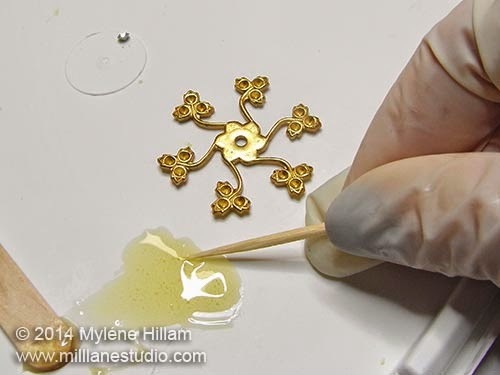 With wedding jewellery still my focus this week, I'm going to show you the second method I've used to include Swarovski crystals in these special pieces - using adhesive. 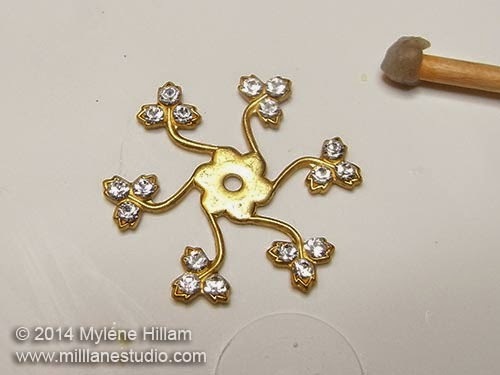 I'm using chatons (sometimes known as pointy backs and V crystals) in a brass cup setting or brass stamping. The chatons have a foil backing which enhances the crystal's cut to create its reflective sparkle. When selecting an adhesive, you need to keep this in mind and choose one that will not affect the foil. 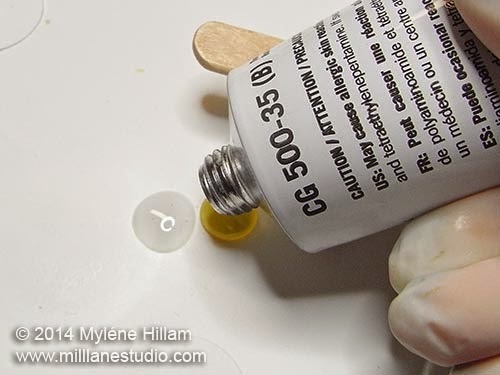 For a special piece like the ones I'm working on that need to last a lifetime, I've chosen a 2 part epoxy adhesive. In this instance I'm using Swarovski's own CG 500-35 because it has more working time than regular 5-minute epoxy. The extra time will mean I only need to mix one batch of epoxy but the drawback is that it will take longer to grip. But one of the major benefits of using Swarovski's own 2-part epoxy is it's ability to absorb shocks by up to 500% compared with just 10% for regular 2-part epoxies. That is a huge benefit when creating keepsake jewellery! The epoxy comes in two tubes, one for each part - A and B. When you remove the caps from the two tubes, you'll notice that there is a foil seal and that the caps have a piercing spike. Use this to pierce the foil. You can see it's left some on the spike so wipe it all away with a tissue. Oh, and don't forget to wear gloves whenever you're working with epoxy so it doesn't come into contact with your skin. Remember, epoxy is a resin and resin isn't good for your skin. Squeeze out equal amounts of both parts onto a disposable plastic surface. I'm using the lid from an ice cream container - a takeaway container lid will be perfect too. Mix the two parts together thoroughly with a wooden stir stick. The component I'm using has very small cups so I'm coating the inside of each cavity with the epoxy using a toothpick. You need to apply it thickly enough so the crystal will be surrounded by epoxy, yet thinly enough that it doesn't ooze out. 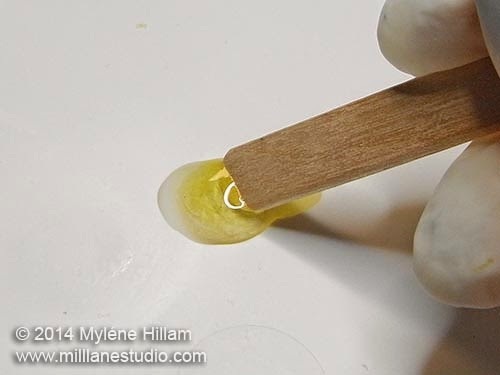 Keep some acetone and a cotton bud (Q-tip) handy to wipe away any excess if you do get a bit heavy handed. Once again, I've resorted to my trusty Embellie Gellie tool to pick up the crystals. 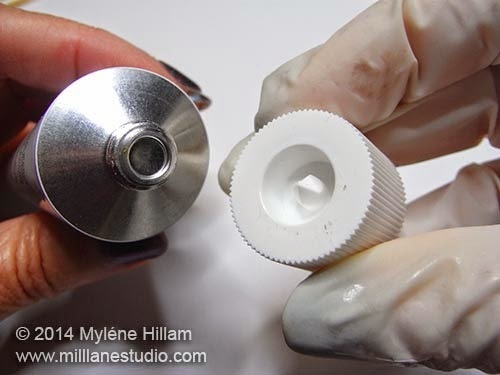 This tool is indispensable when positioning the crystals in the prepared cups. Take your time to carefully place the crystals in the cavities and press each one down after it's positioned to make sure it's sitting level in the cup. Set the piece aside to cure. This will take a full 24 hours. If you try to work with the component before this time you risk moving the crystals or worse still, loosening or even losing one so be patient with it. If this does happen, all is not lost. 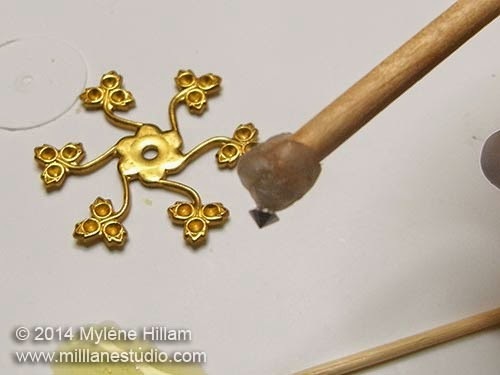 You can still use 5-minute epoxy to reset/replace the loose crystal and continue working. Some other adhesives you can consider when gluing crystals in cup settings are: E6000 and GS-Hypo Cement. These don't require any mixing but in my experience they don't have the permanent adhesion for this type of application. 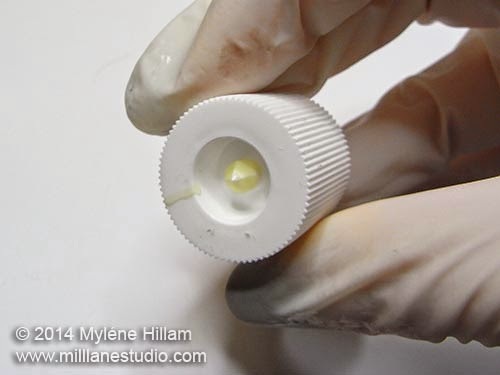 Avoid crazy glues and super glues which can affect the foil backing over time and lead to a dull and marred crystal. 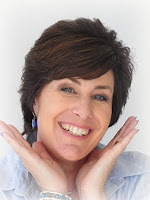 This is such an easy technique and it will allow you to tailor your handmade jewellery to suit whatever colour theme your special occasion requires. Build up your own unique design by layering two or three of these in different shapes and sizes to create stunning, focal elements.... you will look a million dollars!